I learned about the Simple Caractere bazaar in Kifissias 282 through the lovely elianoula on twitter last Thursday and I was very eager to visit it. You see, I imagined this would be a much more civilized event (compared to to the last bazaar I attended) as it will be open more than a single weekend of mayhem, more specifically until the 15th of May. 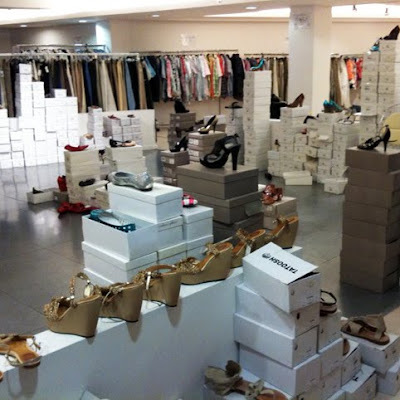 Moreover, Simple Caractere is the importer of Maloles shoes in Greece and I thought it wouldn't hurt if I could score some of their signature ballet flats on sale, before my two current pairs give up from the consant use. Unfortunately there were no flats in my size. 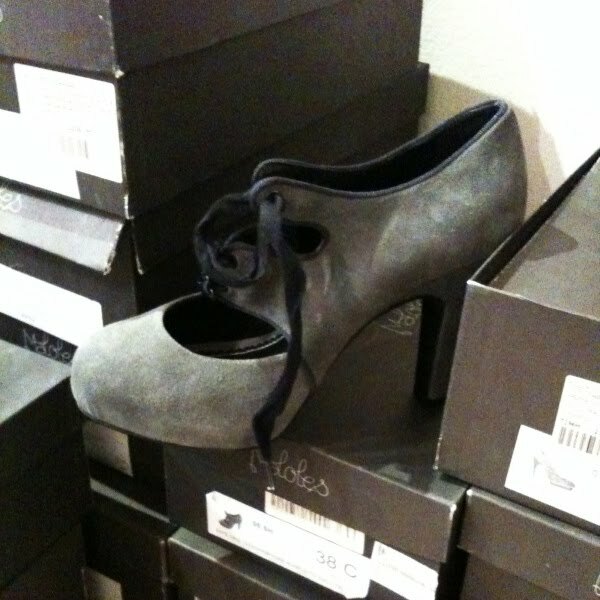 However, I did spot two size 38s of the grey suede Maloles heels I got in Empoli Outlet back in February, and also some sizes in black. If you loved them back then, now is your chance! The initial price was €325 and the box says €140, but if you do the math according to that 70% off sign hanging above them, they will ring up to €97,5. Not bad for Maloles! Dreamy silver sequins on dusty pink silk chiffon, this Ambre Babzoe top spelled bliss in my head. Unfortunately, the one I initially found was missing all its tags, so I had to ask at the register for the price. After waiting for what seemed like a really long time, the cashier - who apparently was not in a good mood, as she was arguing with her husband on the phone - decided to grand me some of her precious time and help. 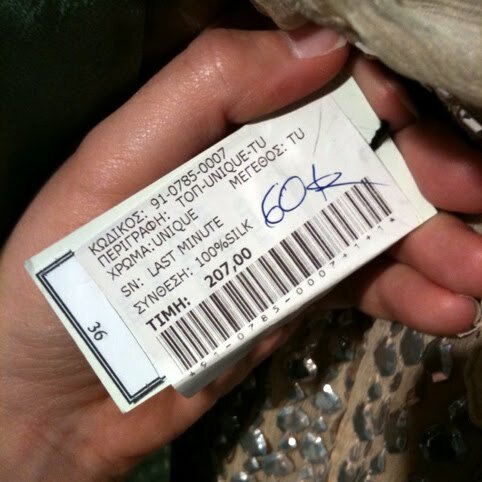 She handed the top to a sales assistant, who went over to ask the boss for the price. She returned saying it costs €90 euros. I thanked her and continued browsing the shop. After a while, guess what I find? The exact same top, only with tags. Original price €207, bazaar price €60. Oh? Huh... Well, ok. That would do too. EXCUSE ME? You just tried to overcharge me €30 and I pointed it out to you. The least you can do is bloody apologize! And "huh, ok" won't cut it. After that incident I tried to continue my casual browsing, but I was furious. What bugs me the most isn't of course the €30, it's the attitude! What ever happened to I'm really sorry madam, it seems like there has been a mistake? So, despite the fact I really loved that top, I was too pissed off to buy it. I put it down and left. And these were my bazaaring adventures of the day. And maybe that's for the best too, I don't actually *need* any more evening wear, even if it's pink chiffon adorned with sparkly sequins at 70% off. 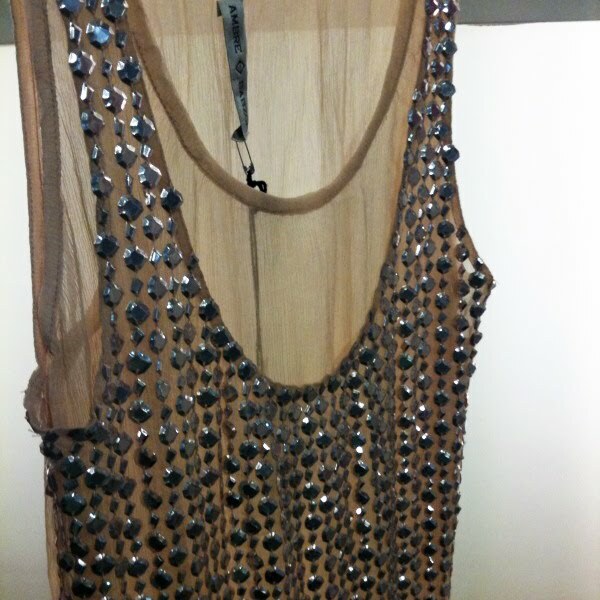 If you do however, the dreamy top is still out there. I am going to agree with Chloe. I'd done the same with you, girl. Read about this on a blog I don't remember right now(Sorry)! Anyway, rude staff at any place is really annoying! Though the bazaar seems interesting! That's the main reason why I didn't get it girls, cause every time I'd wear it, I'd remember that pretentious b!#@tch and it would get on my nerves. Anyway, the bazaar was indeed interesting, but I've been to the Simple Caractere corner in Empoli Outlet several times before and the prices are almost the same. 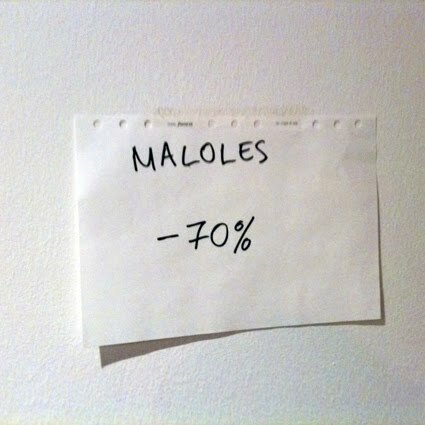 I mean, I got my Maloles heels for €100 there and here they were €97,5 so why bother? bloody hell!!! i just do not get this kind of attitude! i mean don't u wanna sell girl? i wouldn't buy it myself!! Axxx oneiremena Manoles! Tha er8ei i stigmi pou 8a sas apoktiso! Ti ageneia, sigxizomai kai mono pou to skeftomai, logiko na eisai tsantismeni. μα έπρεπε να ήσασταν μπροστά, μου απάντησε με ένα attitude τύπου "άντε κοπελιά, θα στην κάνω τη χάρη να το πάρεις 60"
δεν ισοσταθμιζονται απο τη μια και μοναδικη φορα που θα πεσω πραγματικα πανω στη ευκαιρια. λογικά αν πας πχ αύριο που είναι Σάββατο, μπορεί να γίνεται πανικός, αλλά και χαλαρά να είναι όπως σήμερα, κατά την γνώμη μου δεν αξίζει τον κόπο. όπως είπα και στο ποστ, και στα outlets ίδιες τιμές έχει τελικά και πολύ πιο πολιτισμένο περιβάλλον. You should have told her to start making up with her husband!!! Only then she could be smiley and kind!!! Get a room with your husband and leave me alone, dah!!! well i have worked several times in clothing stores,shoes etc and never never the thought of behaving like that to a customer would cross my mind! !no matter how tired i could be or annoying a customer might get!! and overcharging?? ?this is pure theft!! Vasika pote den dino simasia stis politries.Den axizei na trelenese gia kapies thrasis tipises pou den exoun,kamia fora, idea apo style kai moda!! !Kai exalou mou ti spaei na me perikiklonoun otan beno se ena magazi!! !Mi xaliese loipon...auto tha sou xanasimbei....Apla rixe ena xontro kraximo kai parto to rouxalaki an sou aresei tosooooo poli!!Filakiaaaaaa!!! αλλά στην συγκεκριμένη περίπτωση δεν ήταν αγενής, μου είπε ψέματα γιατί βαριόταν να ψάξει την πραγματική τιμή, και το σημαντικότερο, δεν ζήτησε συγνώμη. αν δεν είχα ψάξει εγώ να βρω το ίδιο μπλουζάκι με καρτελάκια, μπορεί να είχα πληρώσει 30 ευρώ παραπάνω χωρίς λόγο! Στην Ελλάδα οι πωλητές δεν είναι επαγγελματίες. Αποπνέουν μία μόνιμη ενόχληση τύπου "εγώ δεν ήμουνα για 'δω", ένα σύμπλεγμα που είναι άκρως απωθητικό. Φταίμε όμως κι εμείς ως καταναλωτές που δεν αντιδράμε και δεν μεταφέρουμε τη δυσαρέσκειά μας στην διεύθυνση του καταστήματος. Αν αυτό δεν είναι νοοτροπία 'ραγιά' (να ανέχεσαι κάθε είδους συμπεριφορά ακόμα κι όταν πληρώνεις!!!! ), τι άλλο είναι;! loipon exw perasei duo faseis malliwn sth zwh mou. H mia mpoukles k h allh rasta. H antimetopish apo tis pwlhtries einai teleiws TELEIWS diaforetikh me thn deuterh coup...Tha uparxei toulahiston ageneia, kai to klassiko kolaw apo pisw sou mhn soufrwseis tipota...nomizw oti se kati tetoia den prepei na kolwnei kaneis, alla na to anaferei ston idiokthth, na mhn sou pw prwstasia tou katanalwth, les kai ta 30aeura futrwnoun sta pezodromia...eimai to akribws antitheto apo tsiggouna, mallon spatalh, alla to suggekrimeno skhniko pou sou sunevh tha mporouse na xarakthristei apopoira klophs! Borrowed one of your pics for my blog mentioning you! Hope you don't mind!